Dating back thousands of years, granite is one of the most sought-after building materials. Granite is a light-colored igneous rock that forms from the slow crystallization of magma below Earth’s surface. Granite is composed mainly of quartz and feldspar. It is one of the strongest, most durable substances, second only to diamonds. It is more commonly known as one of the most beautiful stones, used in famous statues and beautiful interior design. 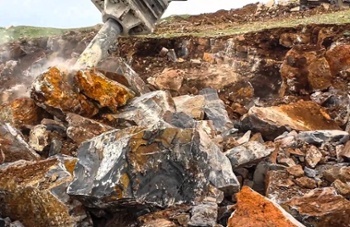 So, if granite is one of the hardest materials known to man, how is this majestic material harvested? First, with the help of geologists, extraction companies look for natural quarries all over the world to find an optimal deposit of granite. They look for the most desirable colors and patterns and, after finding it, they remove the dirt surrounding the stone for easier access. The dirt removal process can take months, as the building of roads, tunnels and bridges are often required to gain access. Once the dirt has been removed, the work of extracting the stone can begin. Initially, bench walls are cut from the rock face, 30ft by 30ft x 12ft. Then, massive granite blocks ranging from 30,000 to 42,000 pounds are split from the walls by applying force to the natural faults in the stone. The granite blocks are then moved out from the quarry using special machinery. Next, vertical holes are drilled into the blocks. Using a high-velocity 4,000-degree torch, the flame flakes* the stone (*the detachment of small flat thin pieces of the outer layers of stone) from a larger piece of stone. The stone blocks are then further loosened by small charges of dynamite. 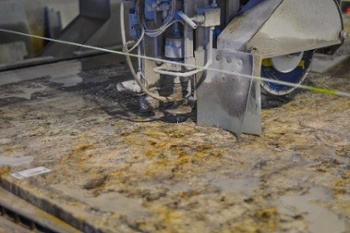 Once the granite is in small enough pieces, it goes to the saws. Diamond wire and gang saws are used to cut through the rough blocks of granite in order to produce slabs of stone that are uniform in size. Diamond wires and diamond saws are most often used for cutting granite, as diamonds and granite are the closest materials on earth in regard to durability. Next, water is sprayed directly onto the diamond wire in order to cool both the stone and the blade or wire as it cuts. Finally, the uniform slabs of granite are run through the polishers. The polishers are used to give the granite slabs a smooth and glossy appearance that everyone desires in their homes. This step is essential for giving the granite countertops their mirror-like finish home remodelers crave. Appropriate rotating pads are applied to the slabs and the abrasive materials work to smooth the rough edges. Depending on the desired type of granite, finish, and overall appearance, different grades of pads are used to attain desired outcomes. The stones are then sealed to protect their color and finish from the elements. There are several types of sealers to seal the stone and complete the polishing process. And this is where you, the customer, join the process. Once the granite is all polished and sealed, the product is transported to warehouses and showrooms so that you can choose your perfect stone counter tops. After you’ve chosen your cut and determined how much you need, the slabs are sent to a bridge saw with a diamond blade to be cut into the appropriate measurements. After that is completed, the sink placement and desired edge profiles are also cut. Routers with diamond bits are implemented in order to make detailed edging to the design of the counter tops. These routers use edging bits to make different edge profiles. Edges range from ornately decorative to simple and clean depending on the requested design. Check out our Granite Countertop Edge Design Visualizer tool to look through our various Granite Selection edging options and how they will look in your home. After the cutting process is complete, granite inspectors examine the stone and, upon approval, our Granite Selection installers transport them to your home and seamlessly install them. Granite Selection works with the very finest manufacturers granite countertopsin Chicago and surrounding suburbs, choosing from the highest quality stones in the most well-known quarries. The entire process ensures that Granite Selection clients end up with the most remarkable, durable and gorgeous countertops possible.